An old adage that I tend to agree with is that you get what you pay for. Naturally, if you pay more, you would expect to get something of a higher quality than if not. That is generally true, but sometimes you can find something that’s cheaper but still of good quality – just lacking a brand name. This is a description the Aukey GH-S5 headset seems to fit perfectly. Whether I’m playing games because I want to play them or for the purposes of review, watching Netflix and the utterly outstanding Stranger Things (finally got around to watching it) or just generally messing around on my computer, I tend to have a headset on. I often fall asleep with one on too, which doesn’t do my ears many favours. So how does a £34.99/$49.99 headset by a lesser known brand compete with bigger competition like the HyperX Cloud Revolver? To be fair, I don’t really think it wants to. This is for people who don’t need – or at least aren’t looking to spend the money on a high-end gaming headset. The build and design quality reflects this more than anything. I do have to say that part of the design is something I am a huge fan of. Much like the previously linked HyperX Cloud Revolvers, the Aukey GH-S5 features something that I absolutely love – big ear cups. I have a fairly large head and ears that could best be described as ‘Dumbo’. Normal headsets and headphones, that tend to have smaller cups, put a lot of pressure on my ears. They normally press against the upper part of my ears and lobes, causing at least an ache after prolonged usage or if I happen to fall asleep with them on. Here, they’re incredibly large and wide. My whole ear fits inside with more than enough space around to let them breathe, reducing heat and sweat to at least a reasonable level. The padding that surrounds the ears is also large enough that you won’t even find them getting compressed if you happen to be laying down with your head on one side – a fairly common occurrence for me when I watch a movie or show before going to sleep. Around the ears and the side of the head, the headset is surprisingly comfortable. Now if only that was the case for the top of the head. 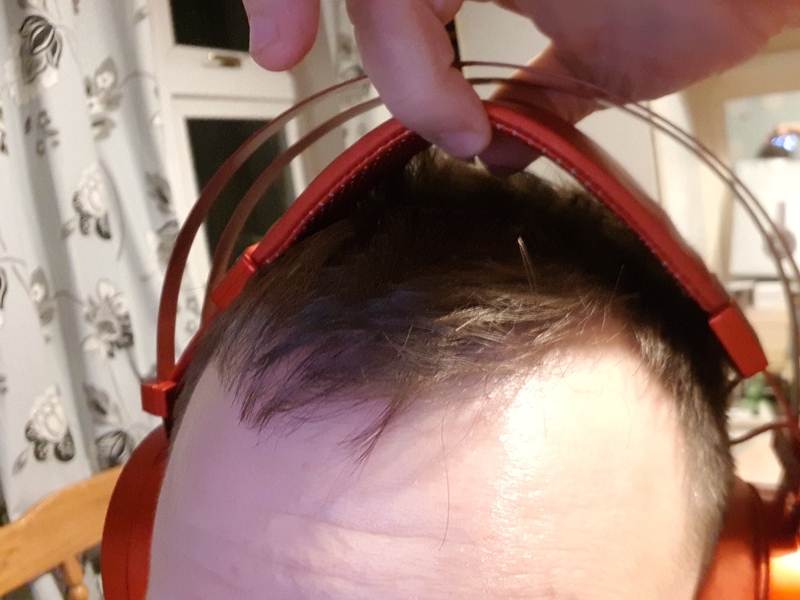 Seemingly borrowing from the – I can’t apologise for mentioning it as much as I have – HyperX, the GH-S5 features a metal frame that connects the ear cups with an auto-adjusting headband. Now that headband is thin, too thin. It feels like what it is – a thin piece of plastic with bare-minimum padding to help with comfort. There is also a noticeable gap between the band and the metal frame. If you physically pull on the band, you notice very quickly that the headphones don’t rest on the top of your head but are hung via the ear cups. Another smaller issue is the fact that the cups don’t rotate in the slightest. This makes it uncomfortable when wearing any glasses with larger frames. The padding doesn’t push into them too much since it’s light and has quite a bit of giving, but over time it becomes noticeable – particularly so if they or the headset starts to move. Fortunately, if you do wear glasses, ones with thinner frames are less prone to this level of discomfort. The build quality and materials used feel pretty cheap. The thin plastic of the cups looks and feels less than sturdy. Most annoying is the fact that if you even slightly tap anywhere on the headset, the sound reverberates. It’s a little easier to do that than you would expect as well, mostly due to the sheer size of it. While we’re on the subject of sound, another issue is the fact that it’s noise cancelling is as effective as a hessian sack – it isn’t. While the padding on the ear cups is large, it’s not dense. As such, each and every sound gets through. When it comes to the cable, the build is somewhat more impressive. Though it does have two significant issues. The cable connecting the headset to the PC is thick, solid and more than strong enough to hold up to any day-to-day use and the controller feels like it could have a secondary use as a weapon. The two core problems it has are the fact that the cable is a fixed 2.2 metres in length. Honestly, it doesn’t even feel that long. Part of this could be due to the controller that feels like an anvil, weighing the cable down as it’s so close to the headphones themselves. The other feature of the headset is the RGB colouring on the cups. The strange thing about them is that they’re always on, with the only control options being to change the colour or pattern. I’m far from averse to any aspects of my gaming rig lighting up – my keyboard, mouse, tower and almost everything else has some sort of lighting – these almost seem a little bland. This is likely due to the fact that they’re always on and the choices for lighting are quite limited. While the build may be a mixed bag, the audio quality is less so. For such a cheap headset, I’m impressed with its performance across the board. Playing games with the virtual 7.1 surround sound left with an immersive experience. Playing a game, you could very easily make out different aspects as well as their locations. The levels, functionality and controls over the microphone are all enhanced by grabbing, installing and adjusting with Aukey’s Scepter software. Actually chatting with other people is an area where Aukey could do with making improvements. It may be due to the fact that the microphone is set pretty far back on your head – it is pretty short – but it can make you sound a little muted. When chatting with others on Discord, I was told a few times that I’d need to speak louder than I normally would. That or they had to turn me up on their end. In a market inundated with budget options, particularly ones from unknown names, you’re always going to find some that are a risk and eventually not even worth a smaller amount of money. In the case of the Aukey GH-S5, this isn’t the case and it’s almost impossible not to recommend it. This comes with one simple thing to remember – it’s a budget headset with equivalent limitations. Despite it being a budget headset, it’s punching way above its weight and it’s heavy enough that a punch will hurt. Thanks to the 7.1 virtual surround sound, large size and cheap price, the Aukey GH-S5 is great value. 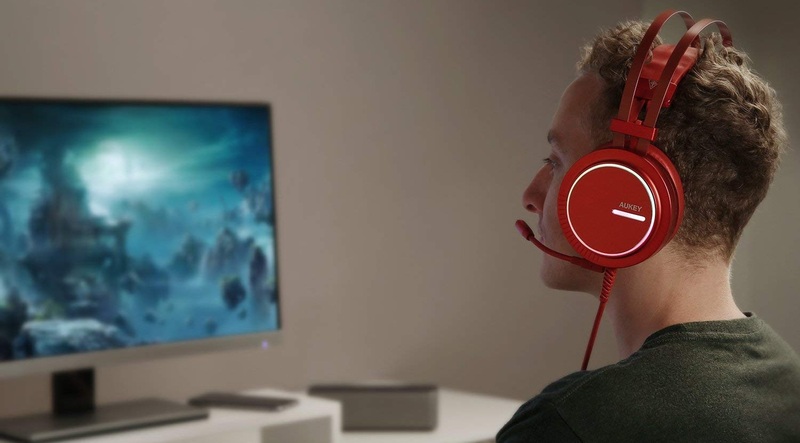 It’s a headset that is more than suitable for jumping into a game and getting a surprisingly immersive experience if there isn’t much background noise where you’re playing. While it isn’t good enough to replace my HyperX, it’s certainly one that I’d recommend for those who are looking for something cheap and easy. Sample provided by Aukey for review purposes. Edit: For the final con of the review, regarding RGB, I’ve expanded what was originally wrote. The Aukey GH-S5, for the price you'll pay for it, is a headset that should more than surprise you. The build quality isn't up there with headsets that cost three times as much, but it's more than comfortable where it needs to be. 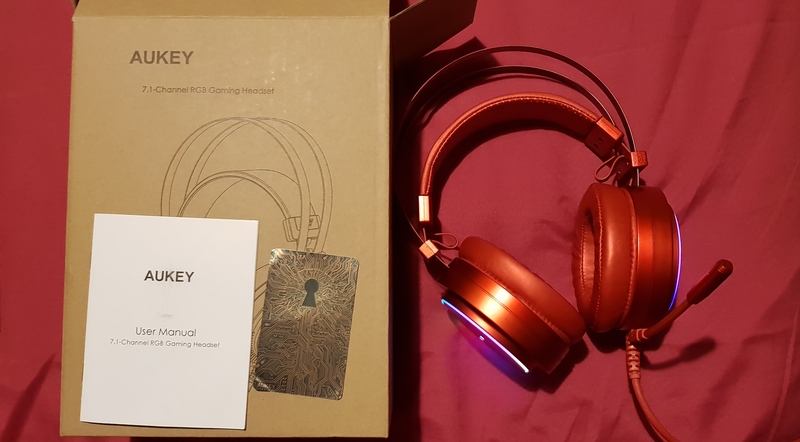 Best of all, the audio quality is great, letting you absorb yourself into games, shows and music as you'd want to - the downside is the noise cancelling, which is non-existent. What happens to be the only other issue is the effect the microphone has, dulling your voice somewhat. All things considered, though, the headset is great for the price you'll pay and far superior to ones of an equivalent price.